B.C. Premier W.A.C. Bennett in 1955. This blog so far has focused on outer space and space exploration, but my interests in technology go beyond that realm. Today politicians and voters are making choices that involve various types of technology. As someone who has worked alongside politicians, I am also interested in the interface between politics and technology. Much of our politics today is bound up in the social and political choices we have made over the past century to base our economy on the use of internal combustion engines for our transportation needs. As a result, our economy is based on oil and other petroleum products, and to a lesser extent on other energy sources such as hydro-electric power. Local and provincial politics in Canada are bound up with decisions over transportation systems, and today all levels of government are making decisions related to Canada's oil resources and the desire to move those resources to market by pipeline and rail. These issues played a role in last year's provincial election in British Columbia, an election where I actively supported the BC New Democratic Party, which suffered an unexpected loss to Premier Christy Clark's BC Liberals. The reasons behind that surprising result are many, and a number of those reasons involve mistakes and miscalculations on the part of the NDP. Here I want to talk about one aspect of that election campaign - Clark's decision to base her campaign on a promise to deliver 100,000 jobs and wipe out the province's debt with the proceeds from development of Liquified Natural Gas (LNG) exports. That promise and the electoral success Clark enjoyed in part as a result of it give her a claim to a prize for the best new variation on an old play in BC politics - using promises of new technologies to conjure up visions of plenty in the minds of voters. Clark's LNG promise reminds me of the great megaproject play made in the late 1950s by the Social Credit government of W.A.C. Bennett, who is widely regarded as BC's greatest premier. Bennett ruled for 20 years, and even the successors of his NDP opponents today salute his memory, in part because he was never afraid to steal ideas from the NDP playbook. In 1957, Bennett announced that his government had signed an agreement with the Swedish millionaire Axel Wenner-Gren involving the construction of a gigantic resources project that would include construction of a $1-billion, 160-mile-per-hour monorail running along the Rocky Mountain Trench up through the Peace River to the Yukon Border, development of a land area the size of Nova Scotia, and creation of a pulp mill and hydro-electric developments. While many of these ideas, notably the monorail, quickly fell by the wayside, the idea of developing the Peace for hydro-electric power eventually took centre stage. Together with other schemes to dam the Columbia river, this developed into the Two River Policy that Bennett is remembered for today. 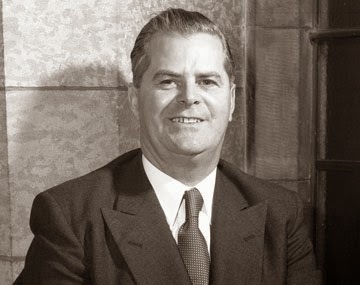 Bennett won the 1960 election after a difficult and hard-fought campaign, and the Wenner-Gren scheme, having served Bennett's political purposes, died within weeks of the votes being counted. Bennett's biographer David Mitchell wrote: "In the end, the Wenner-Gren scheme was nothing more than a fantasy - the Wizard of Oz approach to economic development." But the Peace River power idea gave Bennett leverage in the difficult Columbia River negotiations with the federal government and the U.S. government. The 1960s would be the decade where Bennett developed his power plans, starting with the Columbia River and the government takeover of BC Electric. And Bennett's efforts eventually led to hydro-electric projects in the Peace River. Today Clark's government is considering a long-proposed scheme to build a new dam on the Peace. The dreams of Wenner-Gren were used to help bring BC voters to Bennett's side in 1960. Although those dreams were largely empty, Bennett was able to extract one idea that he put to use in building the province, and incidentally to help him win three more elections. Bennett's son later used his own megaproject for coal near Tumbler Ridge to help win an election in 1979, and even the NDP's Glen Clark worked hard on his 1990s hope to exploit B.C. 's hydro-electric resources to create aluminum smelters around the province. Now Christy Clark has done the same with LNG. Many critics have scoffed at her LNG promises, noting the heavy competition in this field and the volatile nature of energy markets. The premier responded in her throne speech this year with a defiant comparison of her hopes for LNG with President John F. Kennedy's challenge to America to put astronauts on the Moon in the 1960s. Among the many differences between Clark's LNG promise and Kennedy's Moon challenge is the fact that Kennedy's criteria for success were much clearer and far easier to judge than Clark's LNG promises. It is likely that Clark will claim victory as soon as any jobs and and any revenue are created from LNG, regardless of whether or not they come close to the numbers she used in the 2013 election campaign. And her critics - including this writer - will hold her to a higher standard. For today, it remains to be seen whether Christy Clark can deliver on her LNG promise. But it is a sure bet that future BC political leaders will use the lure of fantastical riches from high-tech resource megaprojects to win votes on the campaign trail. March 1 marked the twenty-fifth anniversary of the creation of the Canadian Space Agency, a milestone that has gone almost unnoticed. One reason for this lack of profile may be that the space agency was created in 1989, long after Canada had begun to make its name in space with satellites, the Canadarm and even its first astronaut. Another reason may have been the release in February of the Harper government's long-awaited Space Policy Framework at a moderately high profile event in Ottawa. The CSA's birthday does call for some reflection, particularly as the agency undergoes change under its new president, Walter Natynczyk, and the new Canadian Space Policy Framework. Canada's space program got under way in late 1958 when the Canadian government and the U.S. space agency NASA agreed to work together on exploration of the Earth's ionosphere. The result was the creation of Canada's first satellite, Alouette l, and its launch into orbit atop a U.S. launch vehicle in September 1962. Alouette was built by scientists who worked for Canada's Department of National Defence. During the 1960s, Canada built three successors for Alouette, and then shifted into the field of communications satellites, which remains a focus of Canadian space efforts to the present day. More agencies got involved in Canadian space efforts, including the National Research Council of Canada, Telesat Canada, a Crown Corporation created for Canadian communications satellites, and the Department of Communications. Although several government reports and the Canadian aerospace industry called for creation of a Canadian space agency, the Trudeau government instead created an interdepartmental committee to direct Canada's space program. The unwieldy structure existed for nearly 20 years, even as Canada's space program continued to grow with the start of the Canadarm program in the 1970s and the Canadian Astronaut Program and the RADARSAT program in the 1980s. Finally, in 1986, Brian Mulroney's Progressive Conservative government promised a space agency, but controversy quickly followed. Most Canadian space programs were headquartered in Ottawa, but Montreal quickly mounted an aggressive effort to have the new agency located in that city. This question, along with growing concern over the costs of Canada's contribution to what became the International Space Station, put the promise on the back burner as an election approached in 1988. On March 1, 1989, a little more than three months after the Mulroney government emerged victorious in that election, the government announced the creation of the CSA effective that day under the presidency of Dr. Larkin Kerwin, who up to then had headed the NRC. The government also announced that the new agency would be based in the Montreal area. The location of the CSA headquarters in Montreal was controversial because many anglophone employees based in Ottawa did not wish to move, and because many people feared that an agency located outside Ottawa would have difficulty making itself heard in the nation's capital. 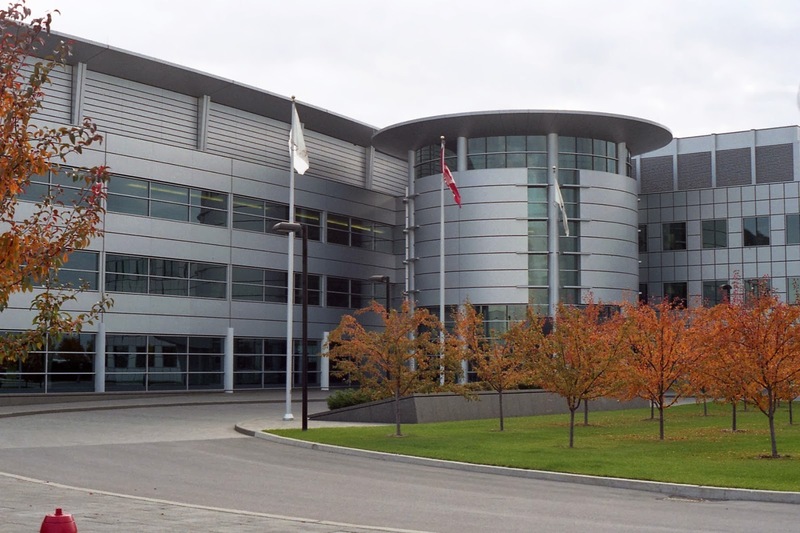 But legislation formalizing the creation of CSA was passed later in 1989, and soon the new headquarters was under construction at a former military airport in the south shore suburb of Saint-Hubert, distant even from downtown Montreal. While Canada's space program has achieved many things under the direction of the CSA, including the creation of the Mobile Servicing System for the ISS, many Canadian astronaut flights, the launch of two RADARSAT satellites, new scientific satellites, continuance of Canadian leadership in communications satellite technologies, and involvement in multinational research efforts on Mars and beyond, it has done so with flat budgets, a lack of long term planning, and an often low profile. These problems led to calls for new coordinating bodies to assist CSA, both in a recent review of Canada's aerospace industry and in the Space Policy Framework. The CSA has sometimes enjoyed strong leadership under people like Mac Evans, who led the agency from 1994 to 2001. Former astronaut Stephen MacLean resigned as president last year after failing to get his plans approved, and the Harper government turned to the recently retired Chief of the Defence Staff of the Canadian Forces, Gen. Walter Natynczyk, to take over the CSA. Natynczyk has had a taste of success with the new Space Policy Framework, but it remains to be seen whether he can maintain the momentum as the Harper government continues to call for austerity and NASA remains mired in the battle between the Obama administration and Congress over the future of the U.S. human space program. The CSA has not met the hopes of its supporters, and some blame its location in Montreal for this problem. Certainly the fact that the status of Quebec has fallen off Ottawa's policy radar in recent years hasn't helped (although next month's provincial election there may change that) . But it is also true that space has rarely been a big policy issue in Ottawa because Canada spends relatively little money on space - even on a per capita basis, our space program costs only a fraction of the U.S. space program. With limited government involvement, Canada has enjoyed a high rate of return on its investment in space in terms of international profile, jobs and export revenues. Canada's space program has rarely been the subject of controversy or partisan division, which may paradoxically lower its profile in Ottawa. For the present, many observers continue to hope that Natynczyk, with his experience in Ottawa as head of Canada's military, will strengthen the CSA during his time as president. Given the agency's relatively low profile, a change of government may not affect its fortunes. 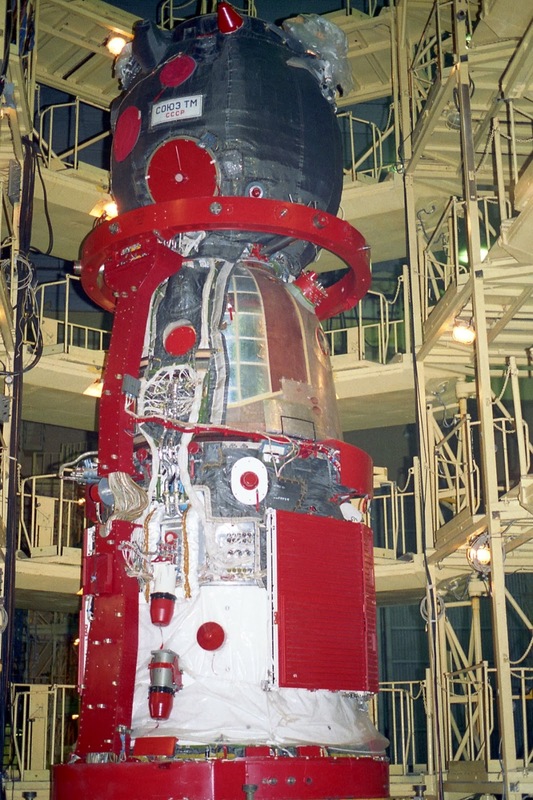 The Soyuz spacecraft - made in Russia, with some Ukrainian parts. Chris Gainor photo. The growing crisis caused by the Russian invasion of the Crimea and threats against other parts of Ukraine could have serious implications for the United States civilian space program - and Canada's. The U.S. and Russia are partners in the International Space Station along with the European Space Agency, Japan and Canada. The station cannot operate properly without U.S. and Russian cooperation because the two countries account for most of the station infrastructure, and both countries are represented on board the station at all times. While Europe, Japan and private American firms have launched robot vehicles to the station to replenish it, all personnel have been carried to the station on either the U.S. Space Shuttle or the Russian Soyuz ferry craft. The shuttle program came to an end in the summer of 2011, and since then everyone who flies to and from the station uses Soyuz. U.S. astronauts find themselves in the unhappy position of depending on their former cold war rival to carry them into space, and this will remain the case for the next few years until a new generation of U.S. spacecraft is ready to carry human passengers. Even though some members of the U.S. Congress have made noises in the past about no longer paying the Russians for Soyuz, the only alternative is to give up America's massive investment in the ISS. Even if the U.S. decides to continue cooperating on the ISS as if there was no problem with Russia, the Russians have the option of impeding American or other nations' astronaut access to the ISS in response to political or economic actions the American, European, Japanese or Canadian governments take to sanction Russia over its actions in Ukraine. Moreover, some components of the Soyuz spacecraft and its launch vehicle are made in Ukraine, and the growing breach between Russia and Ukraine could affect production of these vehicles and reduce access to the ISS. This problem has its roots in the American government's decision to bring the Space Shuttle program to an end before an alternative American spacecraft was available. It has been deepened by the political gridlock in Washington. Ten years ago, President George W. Bush announced that the shuttle program would be wound down in response to the loss of the shuttle Columbia and its crew the year before. He announced the beginning of an ambitious program to replace the shuttle with a new generation of spacecraft to carry astronauts to the ISS and eventually to the Moon and Mars. Unfortunately, this new program was never adequately funded. When President Barack Obama took office in 2009, he instituted a new space policy that called for private contractors to build new spacecraft to carry astronauts into low Earth orbit and the ISS in cooperation with NASA, rather than an old-fashioned program run by NASA as called for by his predecessor. But Republicans in Congress, who are officially in favour of private sector solutions to every problem, opposed the Obama policy and continued to insist that NASA continue to run the big government Bush-era space program in the form of the Orion spacecraft and the Space Launch System, known to its critics as the Senate Launch System. The Republicans have abandoned their free market ideology in space for the simple reason that most members of Congress from states and districts with big NASA facilities and contractors are Republicans, and accepting the Obama policy will cost them votes. NASA is left trying to support two parallel human space programs at a time when cutbacks to its budget make it difficult for the agency to afford even one such program. The result is that the U.S. human space program is effectively held hostage by the Russian government. Another result is that Canada and other partners in the ISS also face being grounded without the goodwill of Russia. The game of chicken being played between the Obama administration and the Republican-dominated Congress over space policy has complicated Canada's ability to plan its own space program because Canada's partnership with NASA is so central to much of its space program. In 2008 when Russia invaded the Republic of Georgia in the face of worldwide condemnation and threats of sanctions, cooperation in space continued without a pause. One reason was the short duration of that war before a ceasefire took the conflict off the front burner of international concerns. The conflict over Ukraine is much larger and will likely be more difficult to resolve. In all probability, the cooperation between Russia and other ISS partners will continue for the time being as in the past. But if the crisis over Ukraine results in a serious breach between Russia and other countries, the result could be that American, Canadian, European, Japanese and perhaps even Russian astronauts could be grounded. This would put the future of the International Space Station in jeopardy and with it, most of the world's human space programs, with the exception of China.